Different country, same results. The New England Patriots went to Estadio Azteca in Mexico City and came out with a big win over the Oakland Raiders, 33-8. QB Tom Brady went over 300 yards passing and tossed three touchdowns as well. The Patriots rushing attack was limited to just 17 carries, but they were effective, gaining 80 yards on those carries. QB Derek Carr put up a whopping 49 passing attempts, but was not efficient with the ball, averaging just 4.8 per attempt. Ultimately, the Patriots defense was able to keep the Oakland offense far away from the endzone despite giving up over 300 yards of offense. The Raiders defense was unable to do the same, with the Patriots moving down the field seemingly at will. With that, we give you our PFF exclusive takeaways from the contest for each team. PFF’s top-graded quarterback had another sharp day, as he moved the chains by finding the open man while avoiding any turnover-worthy plays. He finished 6-of-7 for 78 yards and a touchdown on intermediate (10-19 yard) passes while connecting with WR Brandin Cooks on two well-thrown deep passes that totaled 116 yards, one of which went for a touchdown. 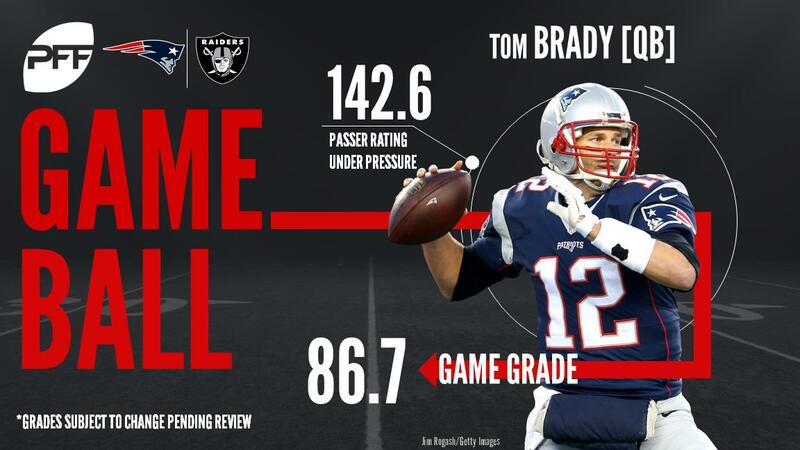 While he was generally well protected, Brady continued his next-level work when pressured, finishing 6-of-7 for 61 yards and a touchdown, good for a passer rating of 142.6. On the receiving end of Brady’s passes was Cooks, who made his presence felt with his downfield ability. He ran away from the defense on a deep post for a 52-yard gain before getting completely behind the defense for a 64-yard touchdown. On the day, Cooks caught 6-of-9 targets for 149 yards and the score, and he leads all receivers with 431 yards on deep (20-plus yard) passes, more than 100 than the next closest receiver. With the Raiders offensive line dominating on the ground, this looked like a game tailor made for Marshawn Lynch. He opened the game with three-straight carries that moved the chains, and on the day he gained 6.1 yards per carry and almost three yards after contact, but the Raiders went away from him and he carried the ball just 11 times overall. This was as good as Lynch has looked all season, including his longest carry of the year at 25 yards. The Raiders offensive line looked at its crushing best on the ground, with Kelechi Osemele in particular wrecking Patriots linebackers in the hole when asked to pull, but also driving people off the ball at the point of attack. Oakland’s only hope on offense was to run the ball, and they didn’t do it enough as the game got out of sight. Mack failed to make his usual impact, despite notching a sack, two hits, and a hurry on 35 rushes. His sack came late in the down in the first quarter, while his best rush of the day resulted in a hit on Brady, though the pass was completed for a first down early in the second quarter. Mack was generally quiet in the run game as well, but most importantly, he was unable to make an impact as a pass-rusher, resulting in his lowest-graded game of the season. One of the bright spots for the Raiders’ defense, Hester had the best game of his young career, picking up a hit and a hurry to go with a run stop on only 24 snaps. Hester’s biggest play was a forced fumble in the first quarter, though the Raiders were unable to recover, so it may have gone unnoticed. He also had a fantastic pass-rush against right guard Shaq Mason that was thwarted only by Brady getting the ball out of his hands in 1.6 seconds.